Custom Addresss and Telephone Books, Personalized in Bulk. Promotional, Very Inexpensive. Lowest cost in USA, Canada. Pocket Size, Refillable. Our economy address and telephone book is refillable each year. They are provided with standard vinyl covers in a huge variety of colors. 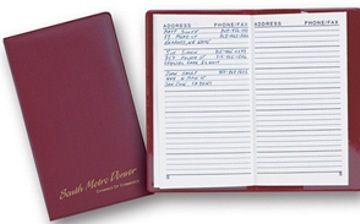 The address book can be personalized by hot stamping of your logo or message on the cover. Lowest cost in the USA and Canada for wholesale personalized address books. American clients pay no taxes. Free artwork design. We will send you a proof for your approval before production. Prices below include your 1-color custom imprint. SETUP CHARGE: $40.00 per order (No Setup Charge on Repeat Orders). SIZE: 3 3/4" W x 6 1/4" H (closed). TYPICAL IMPRINT AREA: bottom front cover.